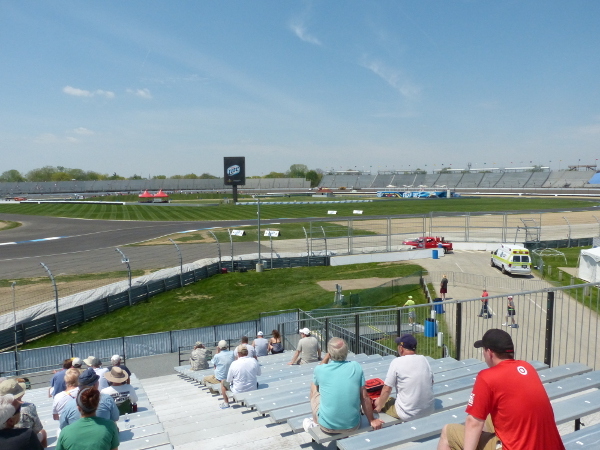 Welcome to the first of More Front Wing’s Spectator Seating Guides! We’re going to work on creating one of these for every track that the Verizon IndyCar Series visits to help fans make decisions about where to sit and how much to pay at each event. 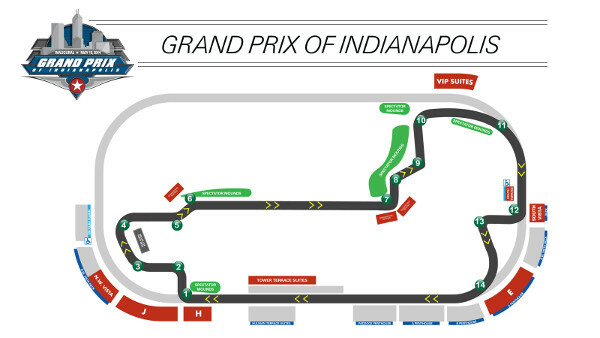 This first Spectator Seating Guide covers the Grand Prix of Indianapolis and is based on the reconfigured Indianapolis Motor Speedway road course. The images were captured on May 8, 2014, and ticket prices shown are as at the 2014 event. The first two pages of this guide will cover the reserved seating options beginning at turn 1 and ending at start/finish. The third page will review general admission seating options. The last page will offer the final verdict on where fans can find the best seating value. 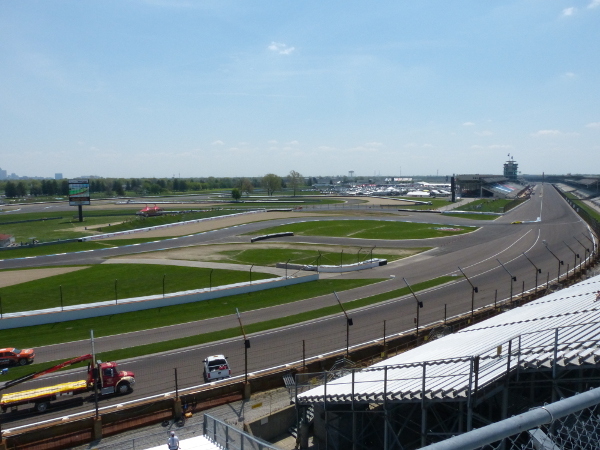 A disclaimer before we begin: this site and this post are in no way affiliated with the Indianapolis Motor Speedway, and these photographs and opinions are my own. Here we go. 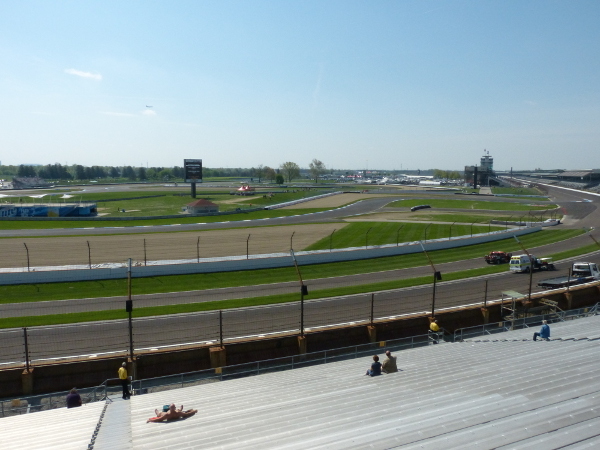 H Stand/J Stand (2014 price $62): These are excellent seats and probably the best value in view per dollar spent – you get most of the front straight and a clear view of every turn from T1 through T6 and into the infield straightaway. H Stand is only open from section 18 and northward; aim for a lower section number in both stands to be as close to T1 as possible, and choose the highest row available for the best view. NW Vista (2014 price $62): Comparable views to H and J but not as close to T1, so you lose some of the front straight and some of that start/restart dicing action. If you can’t get into the deck (which you can’t in 2014 because it’s sold out), opt for H or J unless the row you can get in NW Vista is significantly higher than you can get in the other two stands. NW Vista Deck (2014 price $77): Best seats in the house. Great vantage point for the entire south end of the track. Unfortunately, these seats are very limited and are already sold out for 2014. But those who were smart and ordered early are in for a heck of a show! 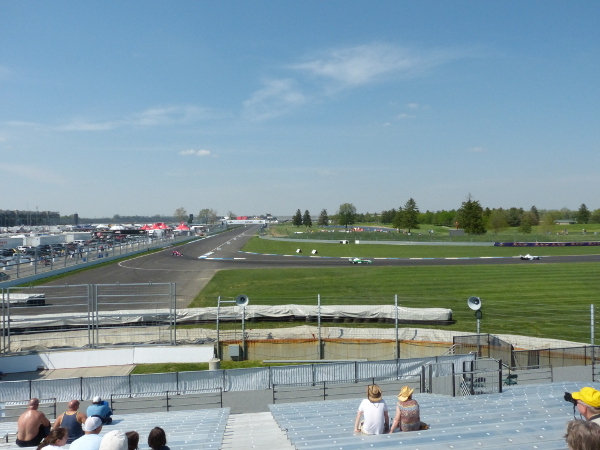 Corner 5 Grandstand (2014 price $51): The view from the upper end of this grandstand gives you from T4 through to the entry to T7 (though that is quite distant). At this price point this stand would be my second choice, and there are GA mounds that offer equivalent or better views. Only purchase here if a guaranteed seat is very important to you but you want to be in a place where you can wander around easily. 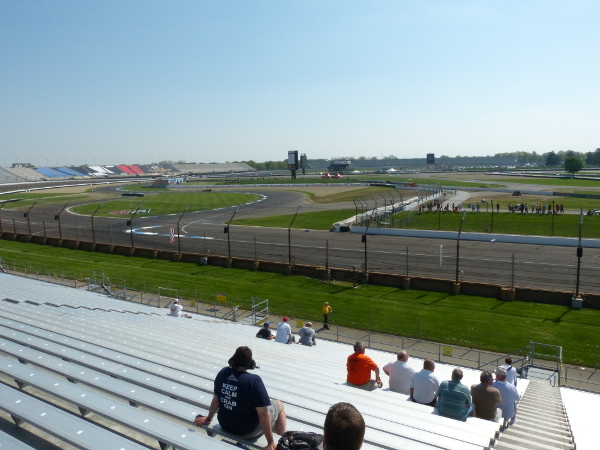 Corner 7 Grandstand (2014 price $51): This one is better value than the T5 Grandstand since there will be plenty of action in T7 during the race. For $10 more than the 2-day GA ticket you get a guaranteed view of one of the track’s best passing zones on both days. A higher row is better, as always, but a lower row won’t do you a complete disservice if you already know this is where you want to be. I’m a firm believer in J Stand. I sat there for the first F1 race, and that’s where I’ll be tomorrow. I do slightly disagree on the lower section number part. In H I’d say that’s true, but in J you have the option of going to the higher sections, which are around the curve into oval turn 4 a bit. That little bit of an angle makes it easier to see down the front straight without having to look around your neighbors as much. Thanks for the input, Jonathan! The post is just one person’s opinion and is more guideline than gospel, of course. We hope it helps fans fine-tune their own preferences. So what is the GA option with a view of a big screen? It was very hard to tell yesterday because the screens weren’t set up yet. I did see one in the T7-T8 complex. I’m sure there will be screens in the other popular spots as well. I’ll try to check that out as I walk around today to see if I can add more information. Thanks for asking! This is a great and timely overview and a lot of work. Thanks! Nice post thanks to share this all information here.